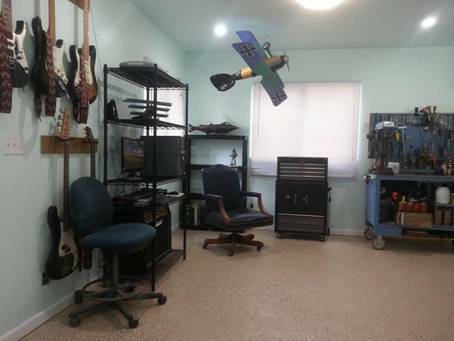 It's taken a long time and a lot of hard work in my spare time to reach this point, but the shop and storage are finally set up and work on the Nautilus Minisub is underway again. This is my new office. Wearing it's rotary collar, the dusty sub rides on a wheeled carrier in the shop. 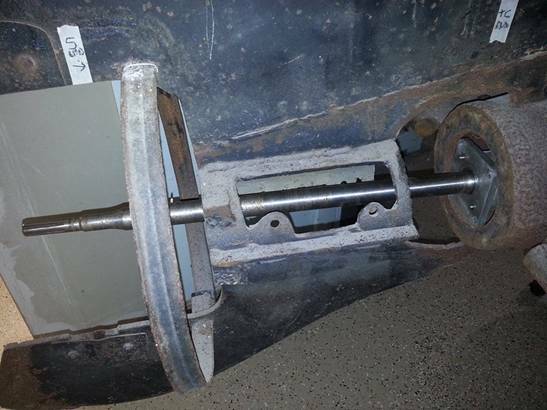 We've obtained the shafts, bearings, seals, couplers, through-hull, and propeller shaft for the drivetrain. Guidance control will be achieved via medical-grade 12-volt actuators to move the rudder and planes. 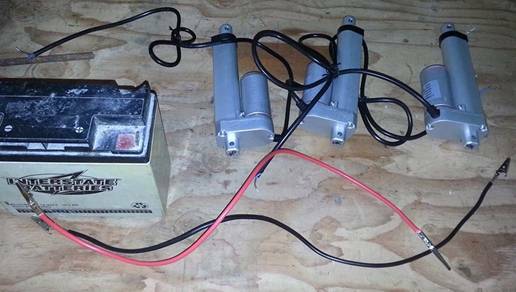 As of September 17th, 2018, I've purchased this 48 volt motor and controller system (with potentiometer instead of a twist grip) rated at 6 hp continuous and 16 hp for sprints of up to one minute. I could have gone bigger and more powerful (and still can if I later want to change the motor and controller) but I don't believe we'll need it. If this boat cruises in the neighborhood of 5 to 6 mph and can sprint briefly at a top speed of, say, 10 to 12 mph; that will be about right for performance, appearance, and spectator appeal. And even by conservative calculations, this system should be able to spin a 10" diameter by 10" pitch propeller fast enough to do that and maybe more. So, with all the major components for the drivetrain and control system upgrades either on our shelves or in the mail, here's the plan. 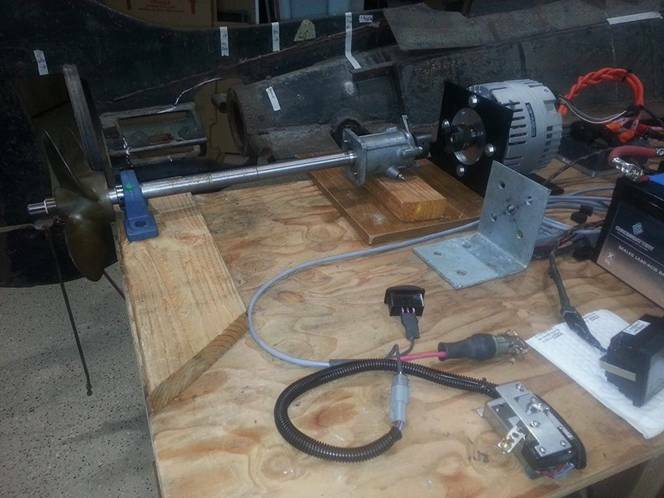 (1) Assemble and water-tank test the propulsion system and bench-test the guidance actuators. 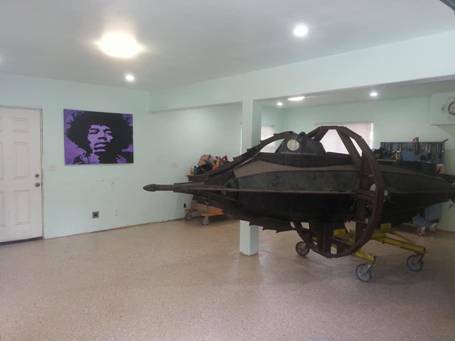 (2) Install them in the submarine using the original through-hull stuffing boxes and shafts; repacked, of course. (3) Install all previously-removed exterior metal plating so she looks exactly like she did during the proving tests of 1991. (4) Check and dry-test weight & balance and adjust component (battery) position as necessary to achieve normal CG with pilot weight in the cockpit. (5) Launch the boat and conduct surfaced and submerged tests of the new propulsion and guidance systems. (6) Modify the hatch, foredeck and pilot house for lighter weight and greater ease of access. 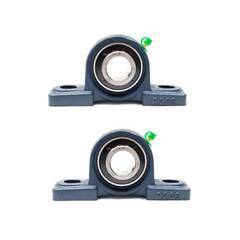 (7) Replace the control through-hulls with pressure-compensated units containing bearings, seals, and packing on lathe-turned stainless steel shafts. Tuesday, September 18, 2018: These are the basic components for the propeller shaft. Two pillow blocks support a stainless shaft with couplers; one mates to the motor and the other to the stuffing box. My only concern is that this shaft has a key slot cut from end to end and I'm wondering what that variance in weight might do when it's rotating at high speed. Might have to swap this for a better shaft. I'll see what kind of vibration we get when there's a motor turning it and decide then if it needs to be replaced. If not; this is what we'll be running. Here it is lined up to measure the length. For the first tests I'll leave the end of the shaft from the JS-550 as is and turn a squirt drive in the test tank because (1) that will be easiest and (2) we already have the squirt drive. All I need to do is put a hydrostatic load on the motor. 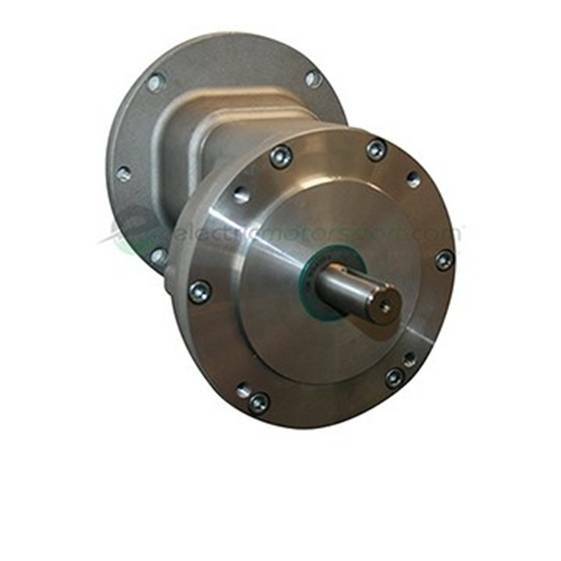 The JS-550 stuffing box contains bearings and seals and is watertight at moderate depths. But after the shaft leaves the pressure hull, it will also pass through a short pressure-compensated bearing-and-seal case that I'll have to make. That will ensure no water even gets to the stuffing box, let alone inside it. So the already slim chances of a propshaft leak into the pressure hull are greatly diminished. When the tank testing is done and we have to go to a propeller for the submarine, cutting this shaft off at the start of the taper will give us the perfect length to put a prop where it should be in the tail section. 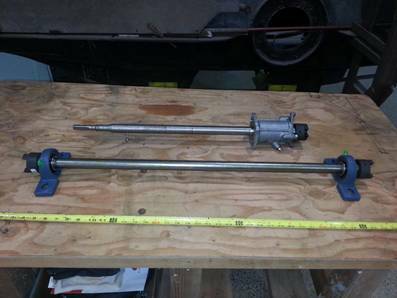 Here's the JS-550 outbox, shaft, and pump we'll be using for the first load tests of the motor. All newly rebuilt and ready go. The water-testing tank will get a hole in the side that the stuffing box bolts onto. Inside the tank, the pump will be securely bolted to a 2X6 screwed to the tank walls, thus keeping the pump submerged. A big, heavy, glass table top will cover the testing tank and we expect to see some real action in there! The stuffing box is watertight but again; I'm backing it up with an externally-mounted pressure-compensated bearing case so water shouldn't even touch the box's aft end. Another important function this unit performs is to act like a thrust bearing. 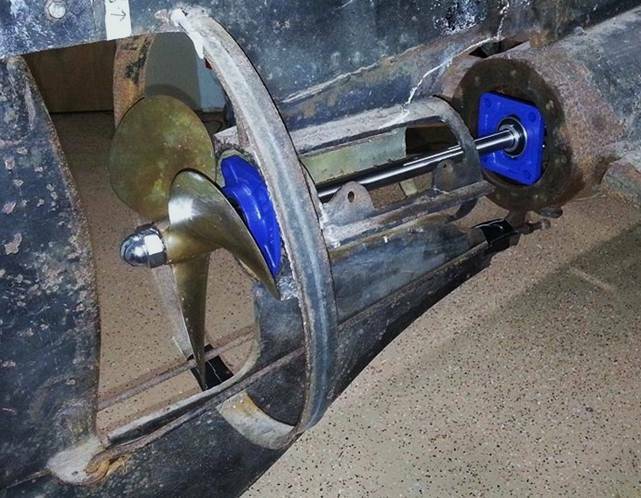 Electric motors like mine aren't made to take the axial loads usually imparted by a propeller so some kind of thrust bearing is necessary to absorb that shock. 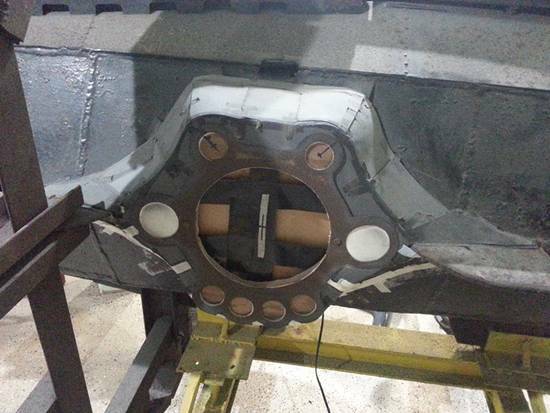 In this case, the stuffing box is bolted to the hull and will serve as a very excellent thrust bearing. 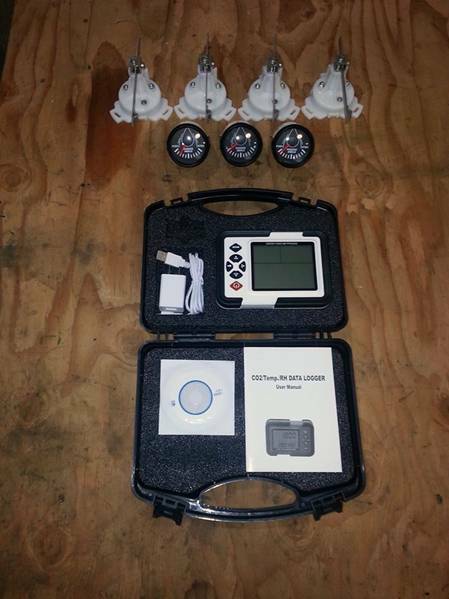 Also today, we got a look at our new gas analyzer that will be monitoring CO2 levels in the passenger compartment. Above that are the position indicators and sensors we have for the rudder and dive planes. 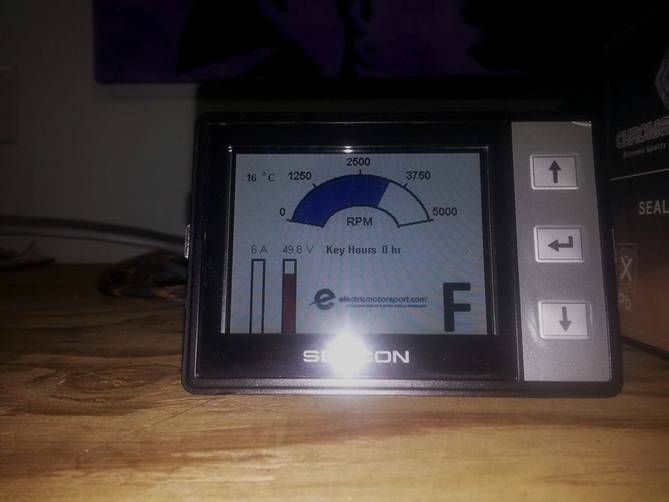 Also today, we added a controller heat sink and the Sevcon Clearview display to our motor order. The heatsink protects the controller and this readout provides necessary information if we want to alter the performance parameters of the motor. 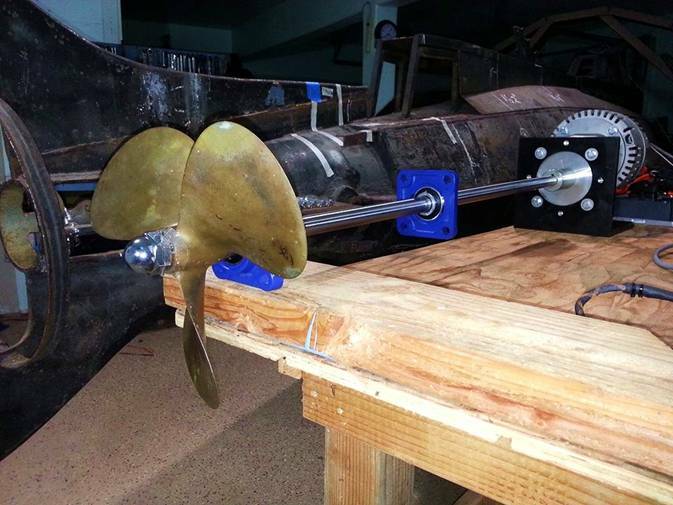 It will also come in handy when doing the wet-tank tests of the drivetrain to determine RPM under load and help us decide on the proper pitch for the propeller. Not inexpensive, but invaluable to the project so it had to be. The company I bought my shaft couplers from only had SAE. The shaft is M18 X 1.5 so I adapted an SAE coupler to Metric. There's a rubber "spider" between couplers to absorb some shock. 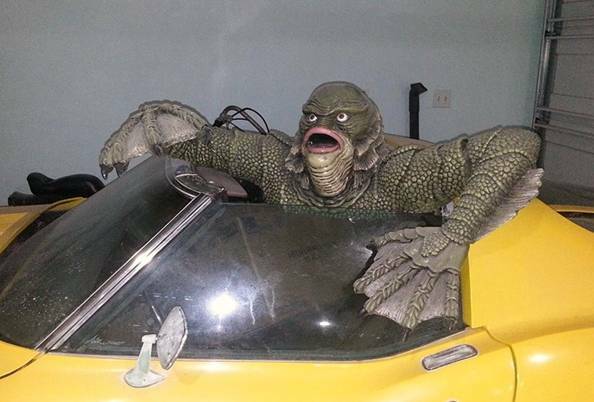 The only problem here is, this shaft is threaded to work with a squirt-drive that turns counter-clockwise and the Disney Nautilus prop turns standard. 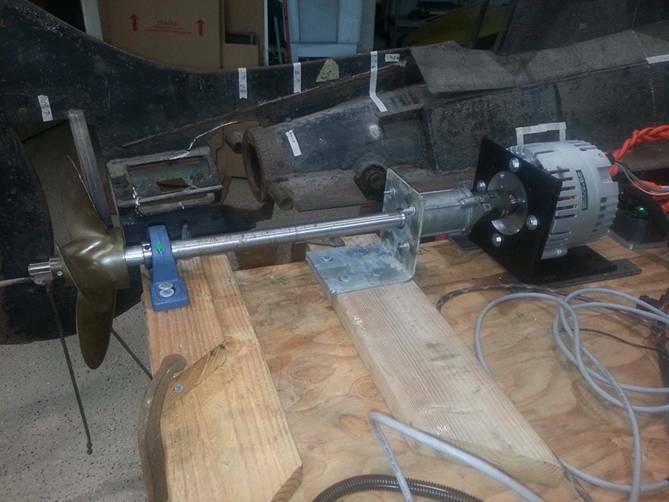 So after we finish the first tank-tests using the hydrojet, I'll have to modify it for a right hand propeller.The couplers come with four threaded apertures with allen-type set screws. I'll chuck it up on the drill press, drill through the coupler and shaft, and install a stainless pin as used in "pin drive" outboards; an easy fix that solves a serious coupler-mating problem. Monday, September 24, 2018: CONTROL ACTUATORS: The linear actuators are out! Too slow! Now, to actuate the rudder and diveplane outshafts and bellcranks, I've decided to use three of these power window motor / regulator units from a Chevy truck. I'll cut the section bordered in red away from the unnecessary metal; put a slot in the regulator blade where a ball-pin on the outshaft bellcrank will ride. 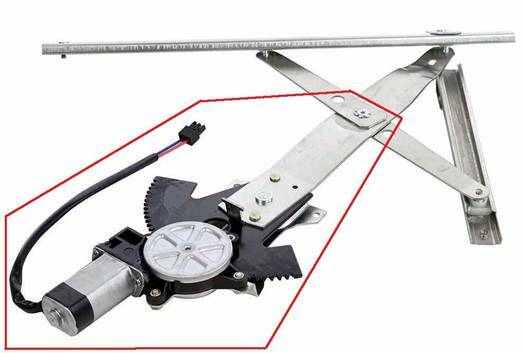 Energizing the motor / regulator will move the bellcrank, outshaft, external bellcranks and connecting rods of the control surfaces themselves. Individual actuators on the dive planes allows for pitch and / or roll control via a four-way joystick switch. 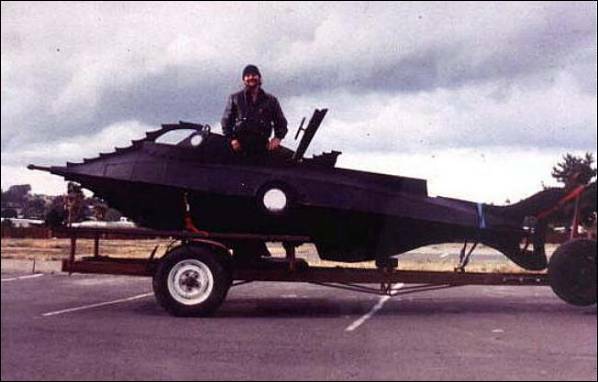 I began the design work that lead to the Nautilus Minisub in the mid-1980's. I have always done my R&D with drawings like this. No CAD. This is all the visualization I need to know it will work. I save the detailed drawings until I'm making the actual part. Many guys I've seen online live to create and share pretty computer pictures of things they dream of building, and oftentimes that's as far as they ever get. (I call that"Analysis paralysis.") I'm the polar opposite of that. 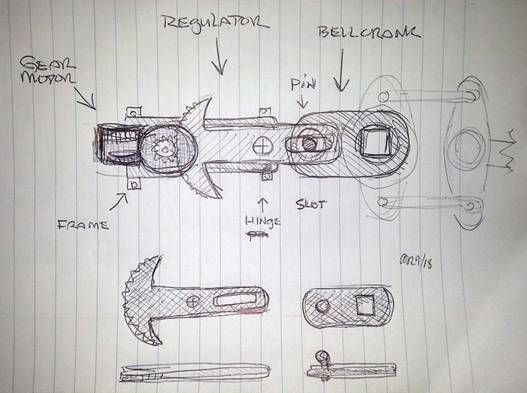 I develop the design in my mind by actually thinking about it, rough sketch it on paper, and build it out of steel. No time or need for anything else. Saturday, September 29, 2018: CONTROL ACTUATORS: The power window motors work nicely! Perfect speed and plenty of torque. Checking the clearances in the tailcone near the propshaft through-hull, existing plumbing for the ballast tanks, and the location of the rudder through-hull packing gland; I might have to use a linkage (like the drawing above) for the rudder. Wednesday, October 03, 2018: PROPSHAFT: Been working on the drivetrain, minus the motor. Looking into mounting the motor as far aft as possible and measuring how that placement might conflict with the existing ballast plumbing and proposed electric guidance control mechanisms. Also seeing how that affects weight and balance. So far, it looks doable. In this pic, I am checking the positioning of the JS-550 propshaft and gear box inside the tailcone where they will eventually be bolted to the end cap. There will be a bearing supporting the shaft at the end of that wrap-around cylindrical motor mount where the original Minn Kota trolling motor once resided. 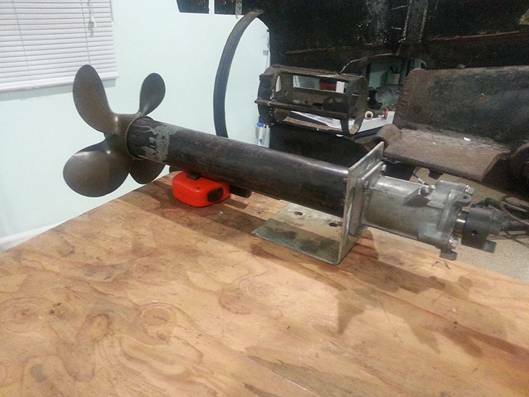 After we've done the hydrostatic loading tests of the motor using a jetski squirt-drive; I'll cut the shaft off at the start of the taper, put a 1/4" keyway in it and thread the end for a pin-drive propeller and nut. Friday, October 12, 2018: THE MOTOR HAS ARRIVED! This is the ME1117 motor and Sevcon controller system I'll be running. 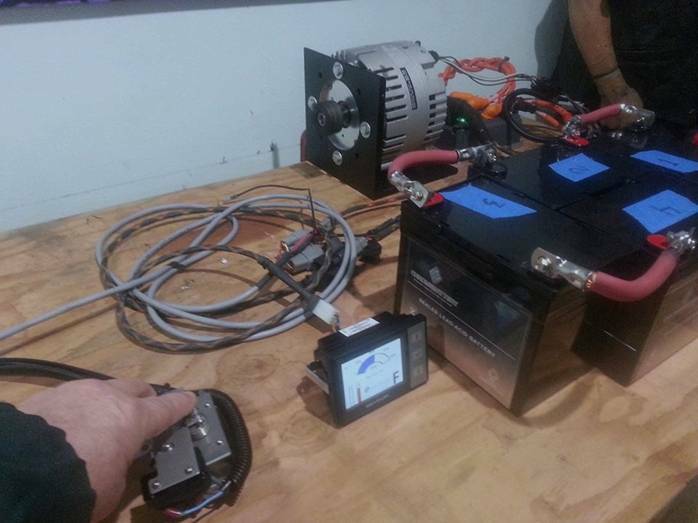 48 volts equals 6 HP continuous and 19 HP for "full collision speed." Next, I will assemble a battery pack and mount the entire drivetrain on a test bench. 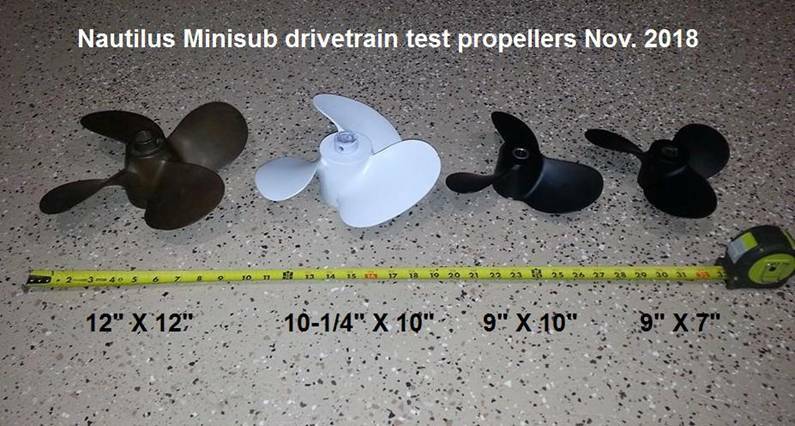 Tuesday, November 06, 2018: We now have the four propellers we'll test the drivetrain with. We've covered a wide range of suitable diameters and pitches and will check how the motor responds to each. 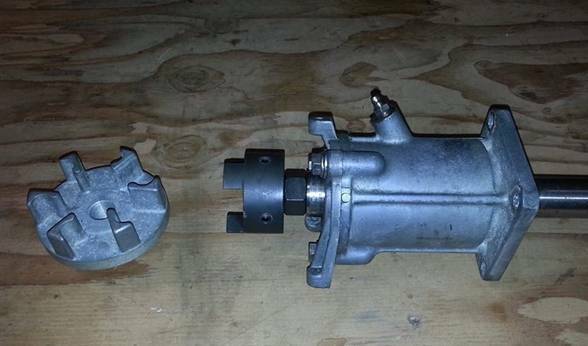 I'm pretty sure we're going to want a gear reduction box but first we'll test these direct drive. 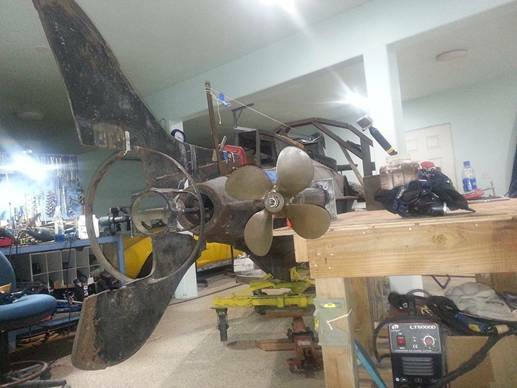 ALSO: I am building my own 5-bladed "Hammerhead" propeller (ala the Disney Nautilus) out of steel. It will be functional but the design isn't very efficient so it will mostly be for looks. When we want performace, we'll be using something like what you see above. Sunday, December 02, 2018: This morning I ordered a 2:1 GEAR REDUCTION for the drivetrain. 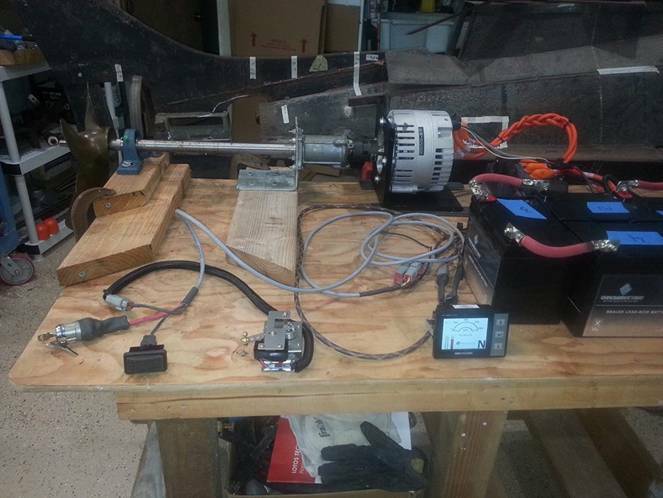 Now, with the motor turning at a comfortable high end of about 4,000 RPM, figuring a 2:1 reduction and a 30% slip on the 12 X 12 prop, the calculated boat speed is 15.9 MPH. In a submarine of this size, type, and purpose; that should be plenty fast enough. And this evening I made the bushing that will adapt the splined end of our metric JS-550 drive shaft to the SAE bore of our 12 X 12" four-bladed Michigan Wheel bronze propeller. I have the parts to adapt a shortened shaft via a series of reducer couplings, but that's more complexity and weight and I really don't want to have to cut this shaft if I don't absolutely have to. The bushing is ground to the proper ID and OD, and the ID flares to conform with the gradual shaft expansion; making for a seamless transition without a "lip" or " gap" where the coupler stops and the propshaft begins. With the prop and coupler installed as seen in this picture, the propeller is staunchly attached and true: zero play or wobble. 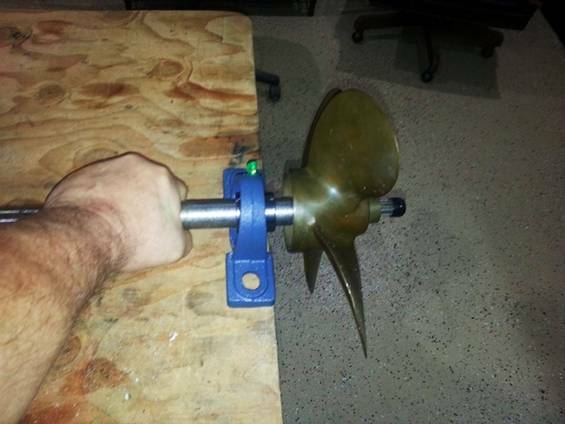 It's a "pin-drive" propeller so I'll drill the shaft to receive pins fore and aft. Eventually I'll trim the end of the shaft flush with the prop and install a hemispherical cap as seen on the Disney Nautilus. Mating the SAE propeller to the Metric driveshaft was the last major engineering / fabricating obstacle to a functional drivetrain. All I need now is the hardware to bolt everything to an 8' 2X10 and then we're ready to start testing on the bench and in the water tank. Tuesday, January 29, 2019: Getting the batteries shipped to Hawaii was a problem; getting them shipped via USPS undamaged even moreso. 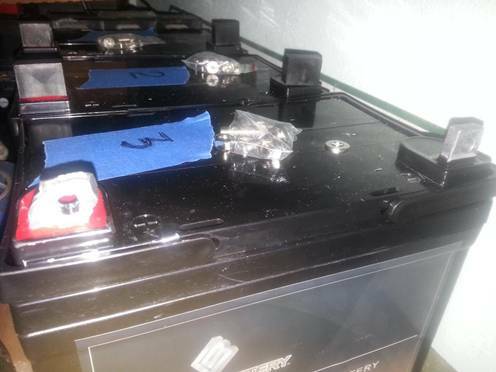 Of the four batteries I received one with a bent positive lug and another with a cracked case, leaking acid. Fortunately, the company will pay for return shipping and replace them but going USPS is chancy. 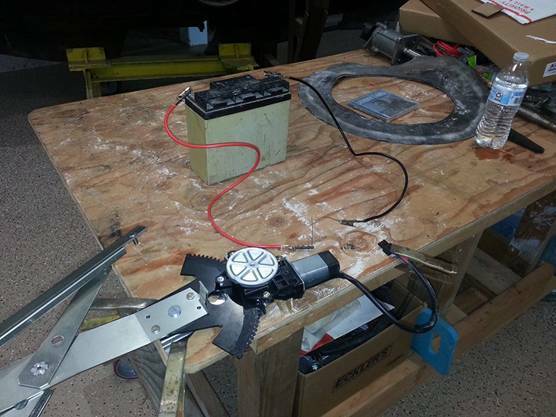 Yesterday I assembled the 48V battery pack and bench-tested the motor for the first time. Everything works as expected. 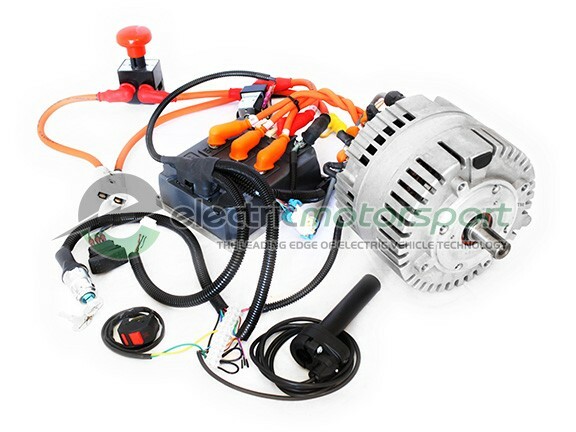 Key Switch; Forward/Reverse Switch; Potentiometer; Servcon display; Battery Pack; Motor; Controller & Harness; Kill Switch. 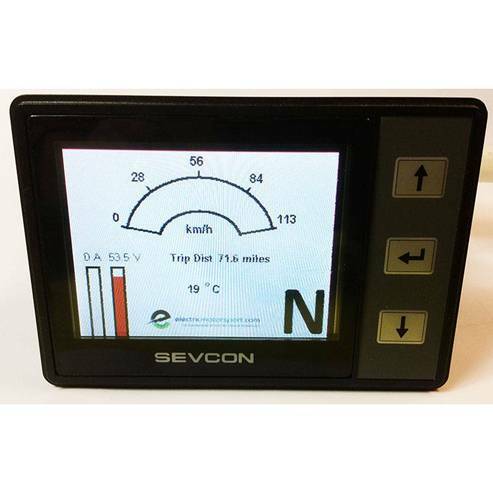 Servcon display shows motor pulling 6 A @ 49.8 V to generate about 3,200 RPM in Forward gear. Hour meter still reads Zero; less than 1 minute. Next, I'll direct-drive the JS-550 bearing box and propshaft to spin the propeller on the bench. Here I'm almost done trimming the bearing box mounting plate and I'm blocking up the propeller bearing with scrap lumber to get the shaft at the right height and level. Propeller; Bearing; Prop shaft; JS-550 bearing box & coupler; bearing box mounting plate; motor. Bearing box mount made and installed; drivetrain set up for bench test. Runs fine. Turns the propshaft no sweat! Next, I make the tailcone pressure-compensated shaft housing and frame mounts out of steel. 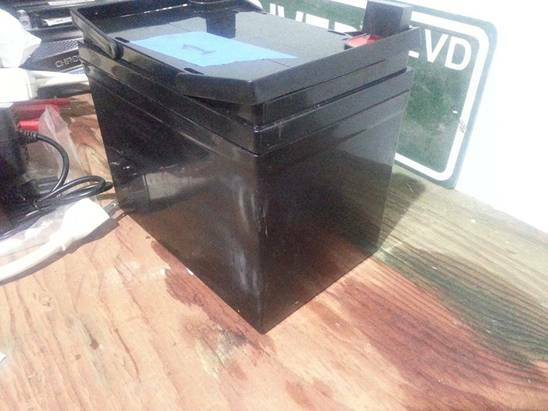 Wednesday, February 06, 2019: One of the batteries had a crack in the case and was leaking acid. I sent CHROME BATTERY a few pics and the replacement battery is in the mail at this time. I was ready to buy a gear reducer last October when an EMS engineer advised me to wait as they were switching manufacturers in 2019. Today, I'm glad I waited. 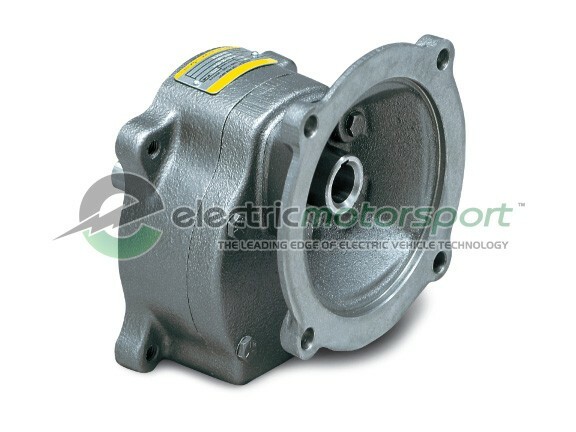 The new gear reducers are available as of day before yesterday; mine is bought and paid for and I'm awaiting delivery with the understanding that there might be a manufacturer's lag of seven days or so. The ones available last year were from China and featured a cast iron case. These new ones are made in the USA, have helical gears, and the case is aluminum. 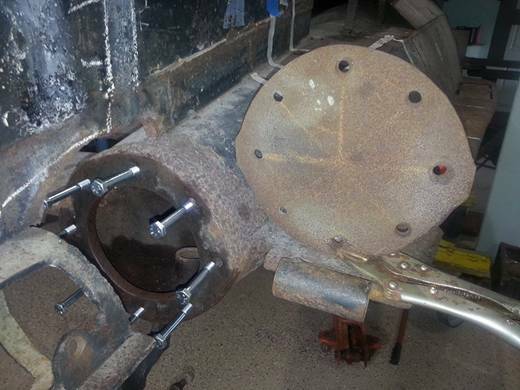 And yesterday I welded the propshaft tube to the bearing box flange and set it up with bearings fore and aft. Shaft turns easily and smooth. The bearing box is rated for 6,000 rpm and is said to be waterproof to one additional atmosphere but I'm not relying on that. 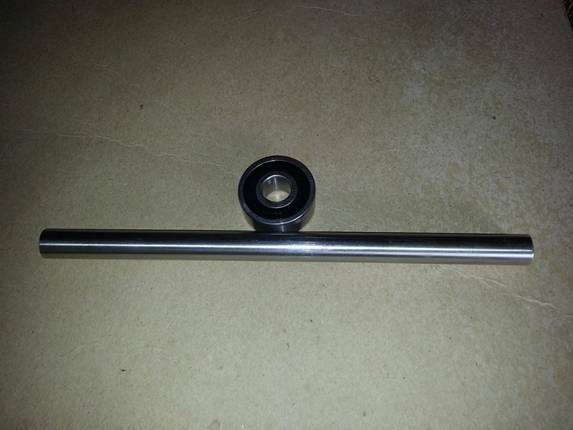 The propshaft tube will be PRESSURE COMPENSATED to keep water from reaching the bearing box in the first place; a little insurance against water leakage at the propshaft through-hull. 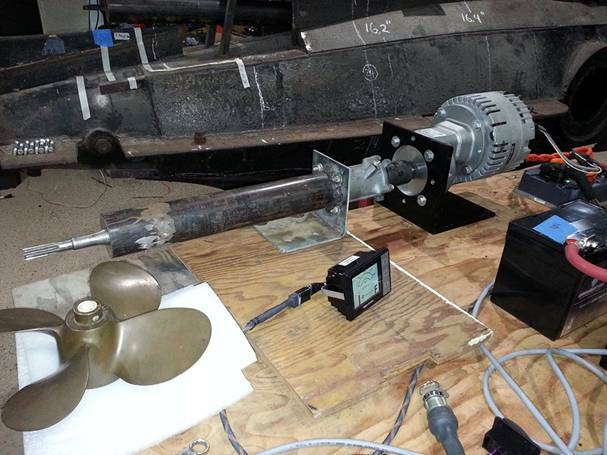 Propeller, shaft, compensated housing, and watertight bearing box looking good so far. Here's the tailcone bulkhead I made 18 years ago; adapted to attach with bolts and a gasket to the drilled-and-tapped tailcone boss. Waiting to put the center aperture (for the tube) in it until the gear reducer arrives and direct measurements can be made. At least a week there. Found a 1/2" variance between "level" on the port and starboard dive plane outshafts. Doesn't affect hull or control symmetry but it's not right, either. So I've been rethinking the rudder and dive plane through-hulls and decided to rebuild all three with bearings, seals, and pressure compensation rather than the homemade packing-glands we dived (successfully) back in 1991. Also, we've always had problems with the hatch design and placement. In 1991, it was heavy, loosely-hinged, and stood upright aft of the CG. The pilot had to drop into the aft passenger's compartment, slide forward under the deck support, and pop up into the cockpit. Not ergonomic at all. For a long time I've worked on designs where the wheelhouse section opens like a knight's visor; straight up either forward or aft. But again, putting that much weight that far off the CG and above the longitudinal centerline just screams "instability!" The answer? 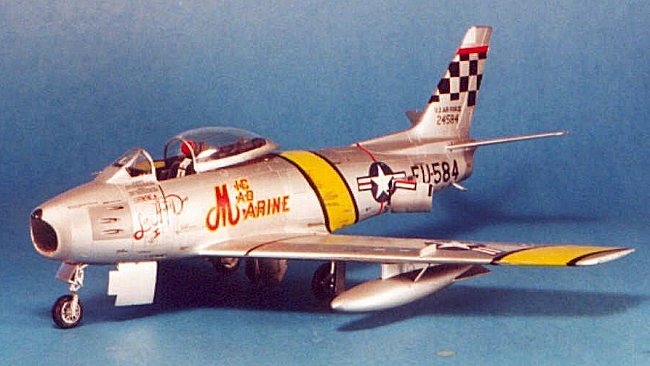 I'm building it to slide aft; something like the canopy of an F-86 fighter jet aircraft. (Not exactly like this; but similar.) The section of cabin and wheelhouse over and around the pilot will slide up and back over the "gills" without standing upright like a sail. 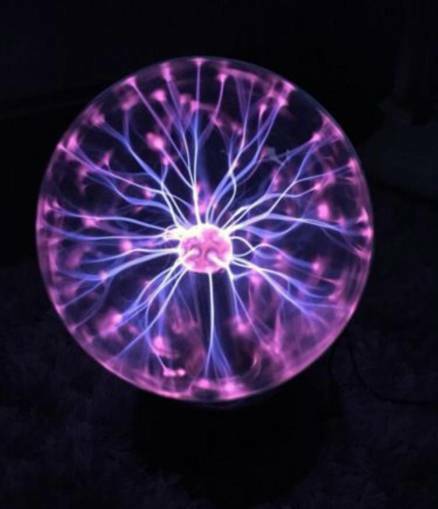 That should work well and look pretty cool, too. Saturday, February 16, 2019: Still waiting on the gear reducer. Meanwhile, CHROME BATTERY replaced one unit that was leaking acid; no problems. A good company to deal with and I'll be using them again. Received and bench-checked one of two 12-volt actuated valves; it works fine. A shipping error delayed the second valve; presently en route. Also, decided to go with genuine HARLEY DAVIDSON axles and bearings for my rudder and diveplane through-hulls. My original shafts are 3/4" stainless and still look useable but I want to make three new boxes from scratch. Harley axles and bearings are also 3/4" and matched to closer tolerances than I'd get using my old 3/4" rudder shaft. Toss in a couple seals, pressure-compensate the housing, and there ya go. 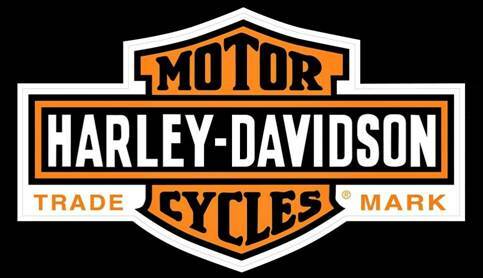 New reproduction 1966 Harley Davidson heel bearings. 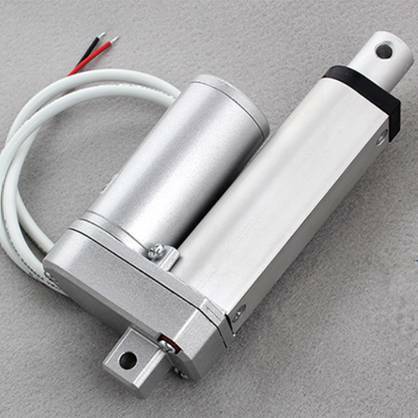 Also, I've decided on 12-volt linear actuators for the rudders and diveplanes. 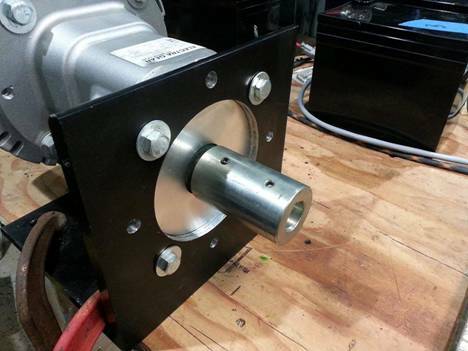 Simple installation; zero adjustments or maintenance; quiet and powerful; fast enough for the task depending on how it's linked to the output shaft. The power window motors would have worked but they are bulkier and space is at a premium in the motor compartment. Of the two choices, this turns out to be the best way to go. Tuesday, March 12, 2019: Been acquiring parts and steel for the project. (More about that on The Clipboard page. ) Have made the decision to make riveted panels (for the exterior detailing) out of 3/32" acrylic sheet with hemispherical acrylic cabochons bonded on with Weld-On Acrylic Solvent ™. Just did a test. Glued two 5mm cabochons together to make a sphere. Also glued one cabochon to a scrap of acrylic. The chem-welded bond is very fast; gives you a chance to change your mind but sets with a powerful grip in only moments. Manufacturer's specs say in 18 hours the bond should be able to withstand 2200 psi sheering force. The acrylic sphere and test piece I made about an hour ago are so solid, I am exerting all the force I can with my fingers and thumb yet can't break the bond apart. And it's not even fully cured yet! Fantastic! No more worries about rivet heads coming off in the water! This is a tremendous improvement over even the best of adhesives we've tested so far. Acrylic on acrylic with acrylic solvent is the way I will do the exterior detailing on the Nautilus Minisub. 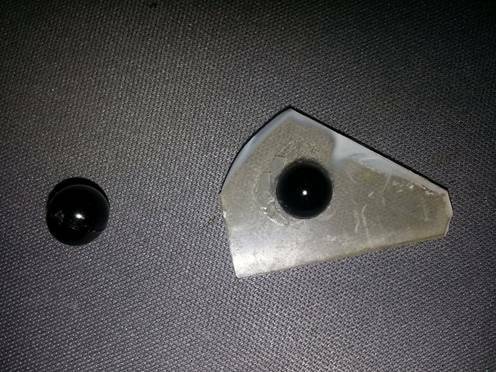 5mm acrylic cabochons; two chemically fused together as a sphere and one bonded onto flat acrylic sheet with WELD ON acrylic solvent. Tuesday, March 19, 2019: PROBLEM. Ran the drivetrain on the bench as you see it in the picture below. Got an unpleasant surprise! 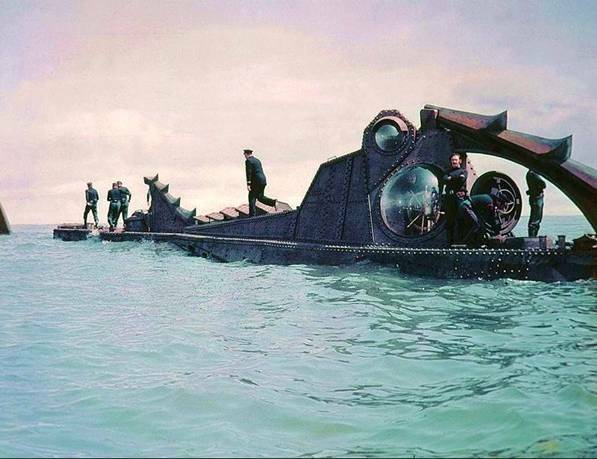 I ordered the motor so it would spin the propeller clockwise, as the Disney Nautilus does. 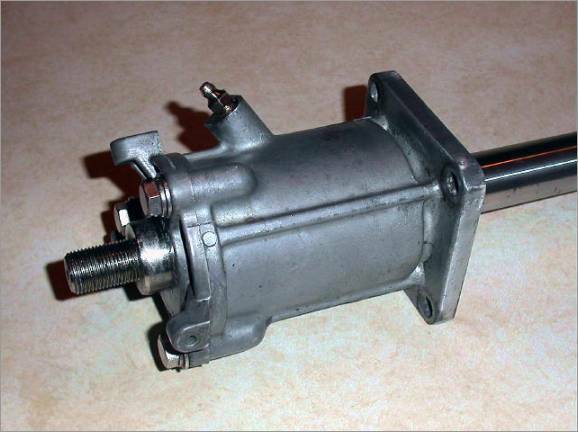 Then I ordered the gear reduction. At no point did anyone or anything advise me that the gear reducer would make the shaft turn opposite the motor. In my case it won't affect performance because the motor is set to provide the same power output in forward or reverse. 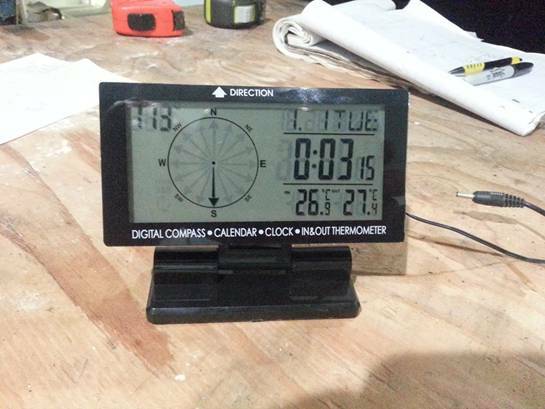 But the indications on the Sevcon display will be backwards: R when we're going Forward and vice-versa. Not happy about that at all. I don't see how a company that provides electric motor components for vehicles can make a mistake that blatant. But there it is. I'll deal with it. Also, I don't really like the jaw-type shaft couplers; too sloppy. Seriously considering revamping the drivetrain with a solid 7/8" to 1-1/8" one-piece shaft adapter / coupler and 1-1/8" stainless shaft all the way to the propeller. 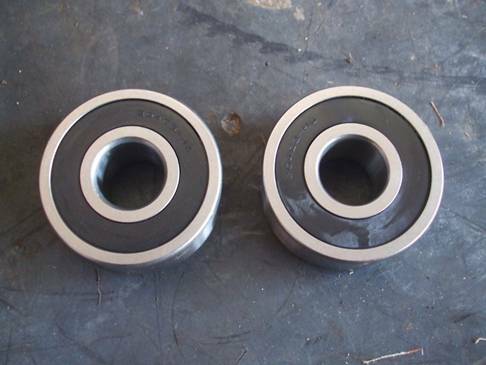 That will eliminate the JS-550 bearing box and shaft; relying solely on the bearings and seals within the pressure-compensated propshaft housing, which I'll handcraft. 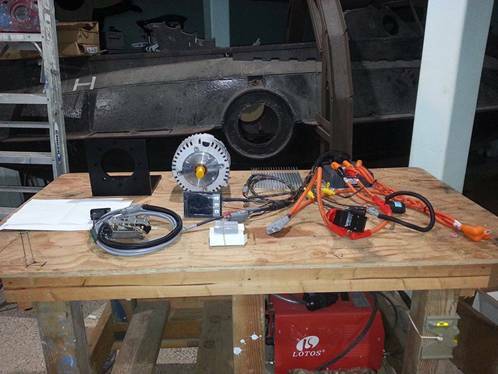 On the upside, this will eliminate the friction of the JS-550 bearing box and allow me to change the length of the propeller shaft to move the motor further forward toward the center of gravity. That's a good thing for this particular application. Wednesday, March 20, 2019: PROBLEM SOLVED. 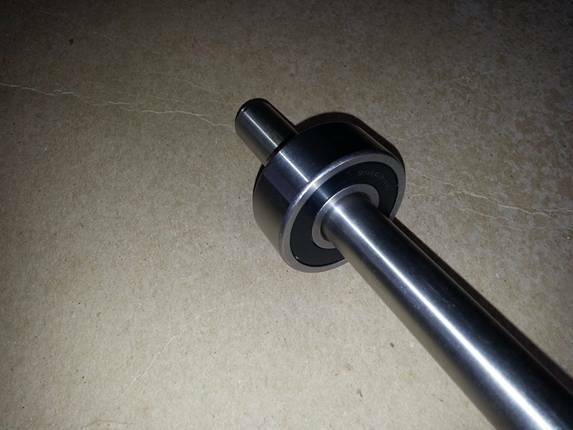 This 7/8" stainless steel shaft coupling is keyed 3/16" and mates perfectly with the output shaft of the gear reducer. 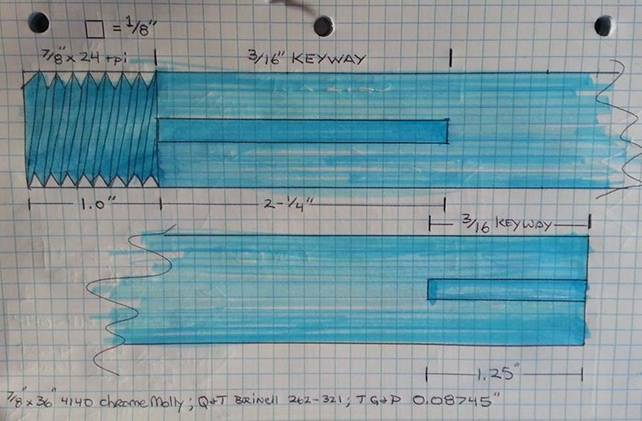 I'm obtaining a 36" piece of 4140 chrome molly TGP stainless steel shafting; will cut keyway slots in both ends and thread the last inch of one end 7/8" X 16 tpi. The shaft will then mate perfectly with this coupling. The threaded end of the shaft will fit into this vintage 7/8" keyed, straight-bore brass propeller; measuring 12" diameter and 13" pitch. It will be secured with a shaft collar forward and a castellated 7/8" x 16 TPI nut, washer, and cotter pin aft. It's a three-blade; not a four like we had before or a five like the Disney Nautilus has; but this should actually give better performance than the one we had before and I'll deal with the cosmetic issues of making a 5-bladed hammerhead prop after the boat's running. But even then; I expect the performance to be miserable and will only use it for display. For now, we'll be running this three-bladed prop. 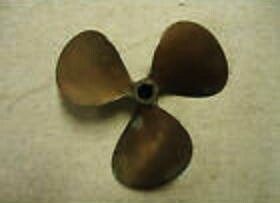 12 X 13 brass propeller with 7/8" bore. 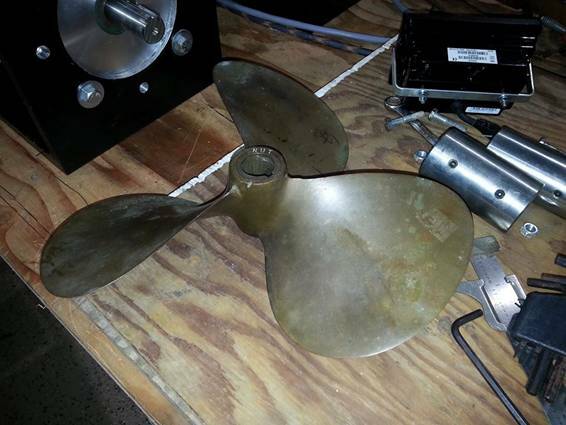 Saturday, March 23, 2019: This is the "new" vintage 12 X 13 brass prop in the condition we received it in; a little patina but the blades are straight, no knicks, and it spins true. I won't have the 7/8" shaft until next week but this prop has a 7/8" straight bore and fits nicely on the output shaft of the gear reducer so I'm sure it will work. 3/4" control through-hull bearing and shaft examples. 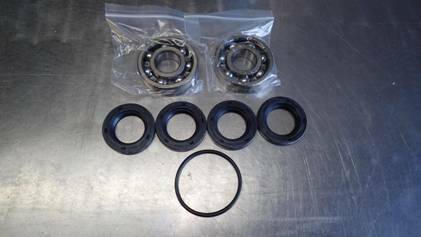 TG&P guidance control output shaft and HARLEY DAVIDSON wheel bearing. Tuesday, March 26, 2019: Here's the new 7/8" drivetrain components loosely assembled on the bench. I could not be happier. The fit is so close that you have to "feel for it" like inserting a HARLEY DAVIDSON wrist pin into a connecting rod. Absolutely beautiful. 4140 - 4142 Chrome Molly; 7/8 X 36 inches; Quenched and Tempered to a Brinell hardness between 262 and 321; precisely Turned, Ground, and Polished to minus-five ten-thousandths of an inch. A beautiful piece of machined stainless steel. For this picture, the flange bearings are situated where they will be when the tailcone mount and propeller shaft housing are complete. The coupler, bearings, and propeller fit the shaft with similar precision, as well. I'll get some Brasso or Duraglit and polish the brass propeller like a United States Marine's belt buckle. That chrome 7/8" x 24 tpi cap nut is from a HARLEY DAVIDSON springer. It's held on with plastic tape for this staged photo. Next, I take the shaft to a machinist and have him thread one inch of one end 7/8" X 24tpi; cut a 2-1/4" long 3/16" keyway in that end; a 1-1/8" keyway in the other and it's ready to go. I gotta fab some bench mounts for the bearings and then we can test it dry. 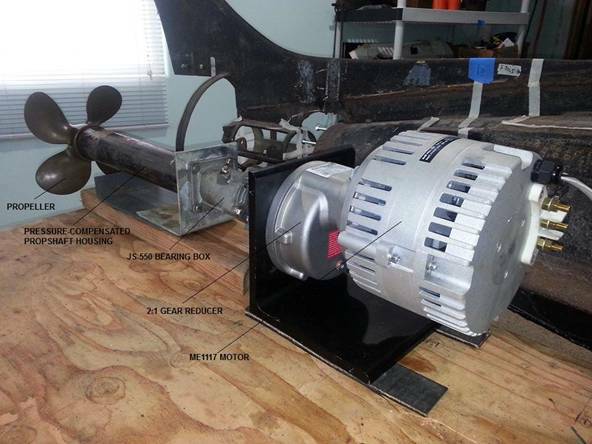 And when I put that aft bearing in the side of a water tank we can wet-test the drivetrain and prop in real time. Gimme a week. ADNOTE: Tonight I located the shaft, bearings, propeller, and cap nut in their general positions and held the cap nut on with a piece of plastic packing tape. Then I installed the rudder and checked to ensure everything fits and the clearances are just fine. I think a 12" prop is about as big as I can run without hitting the rudder linkages but I'm sure it will be more than adequate. Back in 1991, that lightened cylindrical mount carried the lower unit of a MINN KOTA 4HP trolling motor. (And no, it didn't put out four horsepower and nobody can understand why Minn Kota called it that back in the day.) It also serves as an anchor point for the hull longerons, as well as a structural member connecting the horizontal and vertical fins. 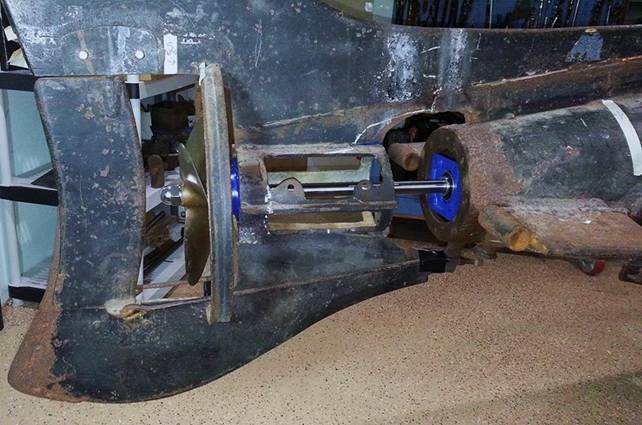 Parts of it will be retained for structural integrity; others removed as necessary to provide clearance when installing the propshaft housing. (1) Thread one end 7/8" X 24 tpi; (2) Cut a 2.25" 3/16" keyway in that end, inboard of the threads; and (3) cut a 1.25" 3/16" keyway in the opposite end. That's all I need.